Once upon a time I was a cat person. Then, in college, I watched my Geology field trip friends pal around with their dogs. I decided I wanted a canine best friend. Bad. I researched A LOT of dog breeds to determine which was the right one for me. Small dogs weren’t even on my radar and I settled on a Rhodesian Ridgeback. Then I ended up living with a roommate that got a Dachshund puppy. I took care of him when she went out of town – which was a lot. I couldn’t leave him home alone so he became my constant adventure buddy. Not “knowing any better” I did all of the things with him that I would have done with a big dog. As I found out later, Dachshunds were bred for tracking rabbits, badgers, and other nasty critters. They were tough little buggers that were used to covering a lot of ground through the woods. It’s no wonder Chester immediately took to things like running 3-5 miles with me, hiking, and generally spending time in the outdoors. I discovered why hiking with a small dog is better. I’ve been hiking with Chester for over 14 years and writing about hiking with small dogs for over 6. I’ve learned that Dachshunds aren’t the only small dog that is good at hiking and loves it. I know several people that hike with their Chihuahuas, including our little friends over at Montecristo Travels. In my research, I’ve discovered that Yorkies and Pomeranians make pretty good hikers too (probably second and third to Dachshunds. While some breeds – because of their breed history and build – are more typically seen on the trails, I’ve seen a whole lot of “non typical” breeds too. Note: please research and keep in mind grooming requirements if any of these breeds catch your eye. I am SO GLAD I ended up with a short-haired Dachshund because they are easy to clean off after a hike. A definite advantage of dogs with longer hair though is that they don’t get cold as easy. Make sure you have enough time or money for regular grooming though if you get a longer haired dog. The standard Dachshund (16-32 lbs), which is a type of hound, originates from Germany, and was bred to scent, chase and flush out badgers from their dens. The miniature Dachshund (5-11 lbs) was bred to hunt smaller animals, such as rabbits. 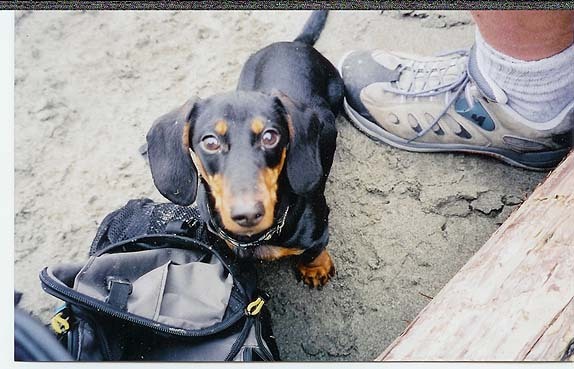 In addition to the standard and miniature Dachshund sizes, the unofficial “tweenie” Dachshund size falls somewhere in-between in size and weight (12-15 lbs). 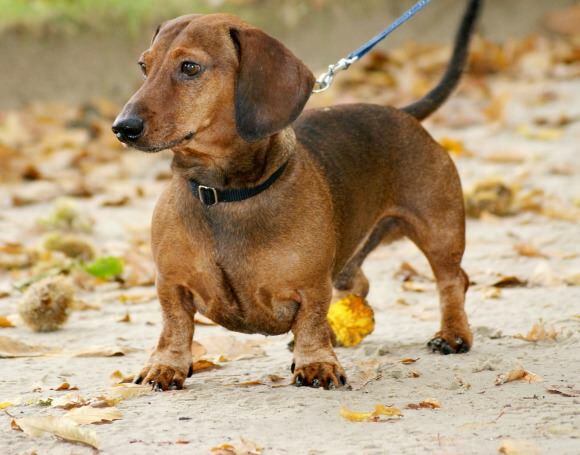 Dachshunds come in three coat patterns – smooth, wire, and long – and many colors. No matter which size, these are small dogs with big personalities, and are generally recognized as being lively, charming, comical, and brave. They are devotedly loyal to their owners (I can, of course, attest to this), and will likely follow their chosen person to the ends of the earth. Don’t let their long bodies and short legs fool you into thinking these “sausage dogs” can’t keep up on the trails. They have far more will and tenacity than one may think, and are surprisingly athletic. The primary health concern a Dachshund owner should be aware of when hiking with their pup is their predisposition to spinal problems, such as IVDD. Living a healthy lifestyle that prevents obesity is one of the primary means of avoiding this. Keeping their muscles flexible and strong helps a lot too. Some veterinarians say that hiking is actually a good way to build spine-supporting muscle structure. Still, a Dachshund owner needs to be aware of IVDD symptoms so they can spot the first signs of trouble. I also highly recommend hiking and walking them with a harness that doesn’t press on their neck if they pull. 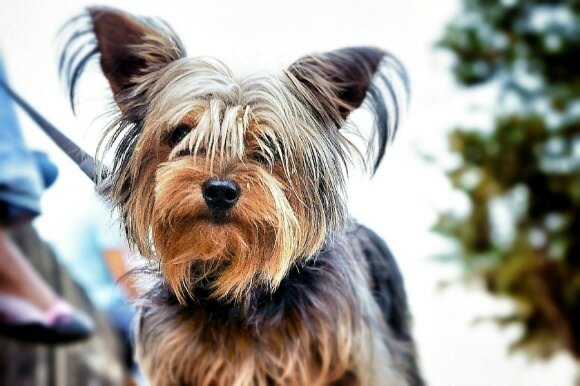 The Yorkshire Terrier (7-15 lbs) was developed in Yorkshire, England during the 19th century as ratters to control rodents in textile mills and coalmines. They have big personalities and need plenty of regular exercise and mental stimulation, as they are pretty inquisitive dogs. They are known to be brave, adventurous, light-footed and fast, and at times carry a certain air of “importance” in their demeanor. I’ve read about Yorkies being good hiking dogs in various forums throughout the years, and get the impression that they’re pretty much second behind Dachshunds. I’ve seen plenty of Yorkies leading their people up hiking trails. However, due to a tendency to be “darters”, it’s important they be kept on a leash. Yorkies are known to suffer from knee issues more than other breeds, so this is something that all owners should keep an alert eye out for. 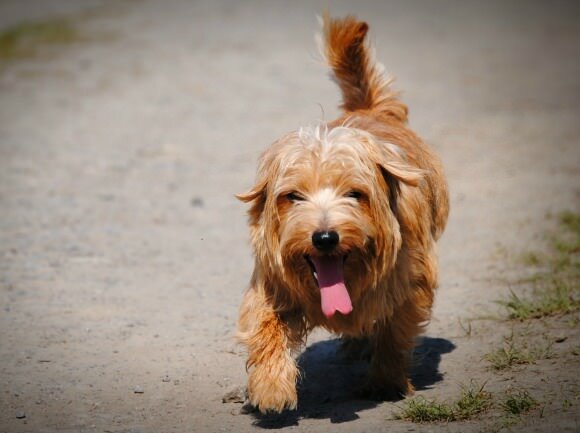 Of British heritage, the Norfolk Terrier (11-12 lbs) is considered to be the smallest, as well as one of the most even-tempered breeds within the terrier group. Originally bred as vermin hunters with a strong prey drive, these dogs are compact, active, agile, and notably courageous. Norfolk Terriers thrive off of human and canine companionship, which makes them both loyal and generally dog-friendly trail mates. In general, these dogs are powerful, athletic, fearless, down to get dirty, and full of energy to run or climb. 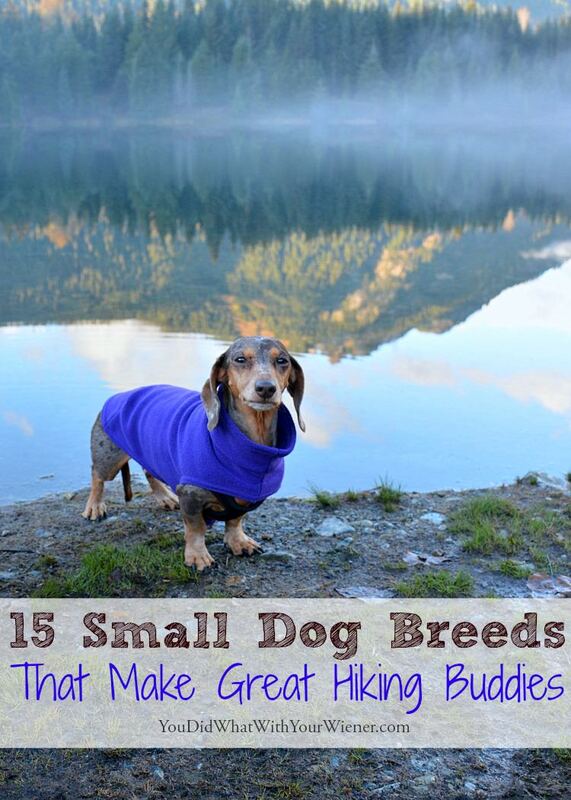 As stubborn as they can be, they are devoted to their humans and can make great hiking dogs. In regards to health, Norfolk Terriers often have issues with their hips and joints, and should be monitored in the event of regular hikes. Originating from Germany, Miniature Pinschers, or Min Pins, (8–10 pounds) are well-balanced, sturdy and agile dogs. They are assertive, proud, energetic, and prone to helping themselves to their own adventures, whether you choose to come along or not. These dogs typically love fast-paced and rigorous exercise, making them great hiking partners. To your dismay, you may even find them waiting and ready for MORE play time after your hike. They can almost always be counted on to bolt after wildlife, as well as disregard your beckoning calls to come back, which is why they need to be kept on a leash during outdoor excursions. 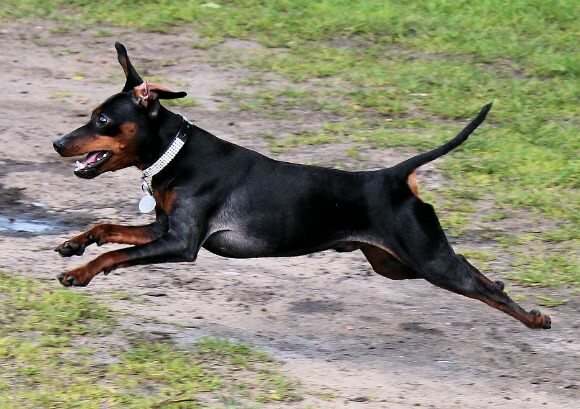 As is common with small dogs, Miniature Pinschers’ knee caps can be unstable and may be prone to popping out of position (luxating patella), which is why it’s important to keep them lean. Named after the Pomerania region of Germany and Poland, Pomeranians (4-8 lbs) became a popular dog breed when Queen Victoria owned and showed her beloved Pom-Poms in the 19th century. Nicknamed the “little dog who thinks he can”, Pomeranians are confident, vivacious, and spirited dogs. They are far from a “passive” breed, and have large personalities that require an equally strong-willed owner. They’re curious and love to proudly check out every site and smell with much excitement (all the while holding their heads up high). Without proper training, they can be neurotic or aggressive towards other dogs, but as with any breed, this will vary from each individual dog to the next. 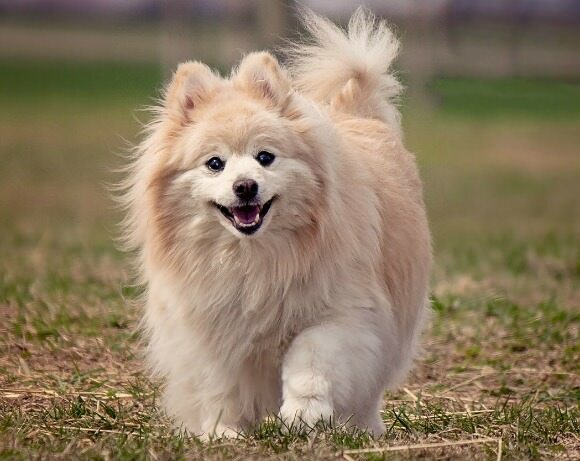 Pomeranians have thick and beautiful fur coats that will keep them warmer than other select breeds, however this may mean quite a bit of additional grooming for the outdoorsman who wants to take his/her dog along. One of the most common health issues Pomeranians may face that would effect their ability to hit the trails is is tracheal collapse, which leads to the closing of their airway, and thus an intolerance to exercise. It’s extra important to use a harness that rests on their breast bone, instead of their throat, when walking or hiking with a Pomeranian. 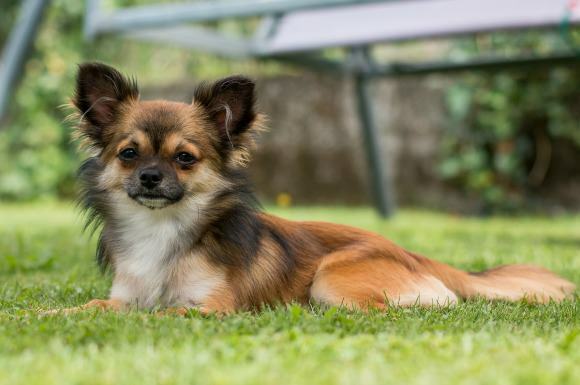 Chihuahuas (4-6 lbs) have somewhat unclear origins, however it’s believed that they date all the way back to the 9th century in Mexican culture. They come in all different shapes and colors, and come in both long and short coat types. Recognized as the smallest dog breed by many kennel clubs, these little pups have a reputation of being feisty, entertaining, and comically quirky. Chihuahuas have energy and a love for the sunny outdoors just like any other dog, and I personally have seen plenty of them hike alongside their humans on trails here in Washington. If a hike is simply too long for a Chihuahua, they are one of the easiest small breeds to carry or stick inside of your backpack. If you’re considering taking your Chihuahua along for a hike, it’s important to note that they’re prone to loose knee joints (luxating patella). Also, they will likely need an outdoor jacket during fall and winter months, as they have minimal fur to keep them warm, their small body mass doesn’t generate a lot of heat, and the breed is originally from a warmer climate. 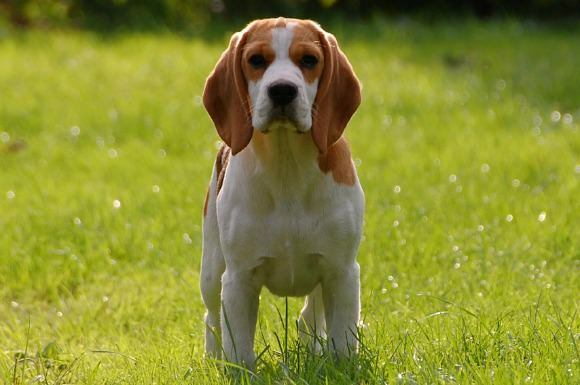 The Beagle (18-25 lbs) is a medium-sized scent hound, developed in Britain to track and hunt hare. The Beagle is a popular dog due to its ideal size, gentle demeanor, and friendliness towards children. It should be noted, however, that Beagles are tracking hounds to their very core, and tend to be single-minded and easily distracted when they catch a scent that interests them. They have a notorious case of selective hearing, and often their instincts trump their desire to obey. They need quite a bit of intentional exercise, which is why Beagles can make awesome hiking dogs. While they most assuredly should be kept on a leash at all times, they are masters of the outdoors, and are most in their element when they’re discovering new places and scents. If you choose a Beagle though, beware that they have a tendency to “bay” loudly, putting a damper on the enjoyment of others on the trail. If at all possible, that behavior should be discouraged. Two health concerns a hiking owner should be aware of with their Beagle is their proneness to certain spinal disk diseases, as well as a condition called “Funny Puppy”, which can result in weak legs and a crooked spine. 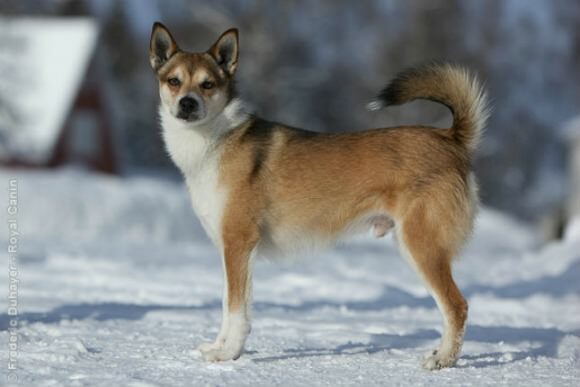 The Norwegian Lundehund (13-20 lbs) originates from Norway, and was historically used to hunt puffins. This dog breed is pretty incredible, as they have the ability to turn their head backwards along their spine and turn their forelegs to the side at a 90-degree angle, much like human arms. In addition to this, they have upright ears that can be folded shut to form a near-tight seal, and SIX fully formed, jointed and muscled toes on their feet (as opposed to the normal four toes that most dogs have). Because of their breed characteristics, Norwegian Lundehunds are designed to be the optimal outdoor dogs, allowing them to move, climb and jump with ease and a sure-footed confidence. In addition to this, they are playful and almost completely non-aggressive. There are currently only 1,400 estimated Norwegian Lundehunds in the world due to them becoming nearly extinct during World War II, so if your heart is set on this breed, be prepared to spend time and money on finding your pup. While these dogs are generally healthy, they can suffer from severe digestive disorders. There is typically no cure, although the disorders can often be managed so long as the owner is willing to spend the necessary money for health care and proper nutrition. 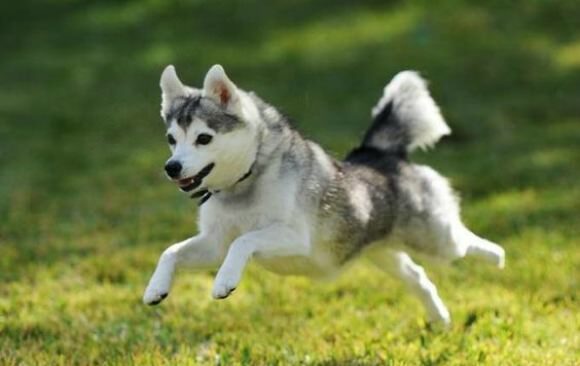 The Alaskan Klee Kai (10-15 lbs) was developed in the 1970s in order to create a companion-sized LOOKING version of the Siberian Husky (it’s a breed unto itself though – it’s not a miniature Siberian Husky). Originally bred in private by an individual owner, this breed was not released to the public until 1988, making it relatively new and rare. They are considered intelligent, active, high-energy, and loyal to their owners. They they can be skittish and shy around strangers so need a lot of socialization (know these things before you get one). They are considered pretty clean dogs who don’t have a “dog odor” and shed only lightly most of the year (they do “blow” their coat twice a year though) so some say they are good dogs for people with allergies. They make for agile dogs on the trail as they are excellent climbers and jumpers. Their thick double coat makes them very compatible for cool weather and snowy conditions. Thus far, this breed is considered to be free of any significant genetic defects, however this could in part be due to the “newness” of the breed and the relatively small gene pool that currently exists. 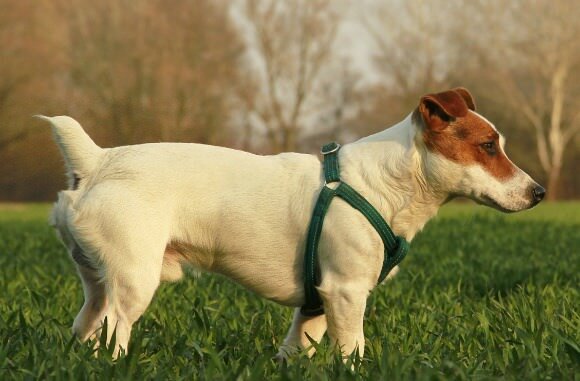 Developed in the 19th century to be highly efficient fox hunters, Jack Russel Terriers (14–18 pounds), or JRT for short, today are some of the most high-energy, hard-working, and intelligent dogs within the terrier group. They are clever and inquisitive, however, despite their desire to please, they have an equally strong (and at times impulsive) desire to chase. They desperately need rigorous active periods, which is why they can make exceptional hiking partners. They need an owner who is willing to spend the necessary time with them to physically and mentally stimulate them. This breed is remarkably athletic, and will do it’s best to keep up at all times, likely out running, out balancing, or out jumping you. The primary health concerns to be aware of if you want to make an adventure dog out of your JRT are ligament issues in their knees, as well as eye disorders, such as cataracts. The Cairn Terrier (13–18 lbs) is one of the oldest terrier breeds, and originated in the Scottish Highlands as working dogs and ratters. As one would expect with any terrier, this breed is intelligent, hard-working, and is happiest when it’s using its superior sense of smell. These dogs are great learners, and love to participate in any event that’s taking place around them (perhaps one of the reasons why a Cairn Terrier was chosen to play the infamous Toto from The Wizard of Oz). Cairn Terriers are very intelligent and curious. They would make excellent and loyal trail mates, with an ability to possibly out-navigate their human. Hiking will also give them plenty of chances to use their keen sniffer. Cairns are strong and sturdy dogs, however they are prone to some hereditary health problems, such as cataracts and hip dysplasia. 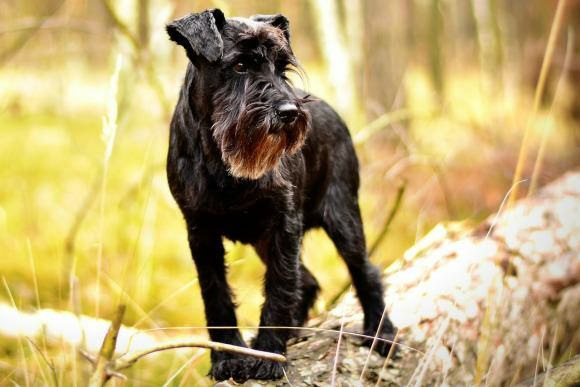 The Miniature Schnauzer (10 -18 lbs) was developed in Germany in the late 19th century as a ratting dog for rural farms. As one of the top 15 most popular dogs in the United States, this breed has a wide range of temperaments, which will vary from dog to dog. That being said, the Mini Schnauzer is generalized as being tough, alert and spirited, yet obedient to command, with a friendly demeanor and an often aloof attitude towards those outside of its direct circle. Miniature Schnauzers make excellent travel companions, with a desire to please and a curiosity for the world. As ratters, this breed has a strong prey drive, and loves activities that allow them to run and seek. Because of their strong prey drive, it’s important to keep them on leash when hiking so they don’t chase after a darting squirrel. 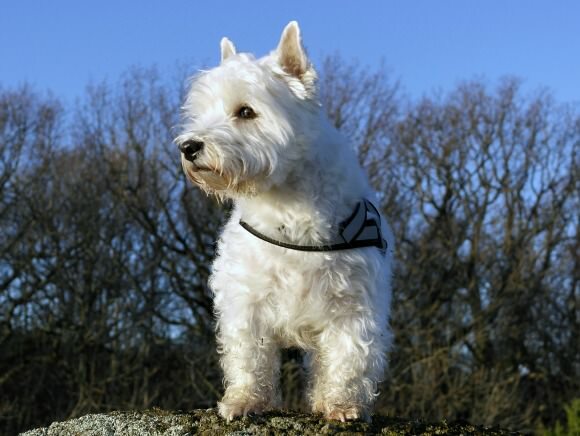 The West Highland Terrier (15-20 lbs) reigns from the lands of Scotland, and was an ideal vermin and fox hunter due it’s stark white coat that would differentiate it from the hunted prey. These dogs have a high self-esteem, and hold themselves with an air of confidence and assertiveness. That being said, they are generally friendly and welcoming of guests, and these busy-body dogs love to be involved in their household events. In general, the word “jolly” is often used to describe the Westie, making them fun adventure companions. Their hunting background means that they are sturdy on the trail. This breed is predisposed to both breed specific AND non-breed specific health concerns, such as hernias, Addison’s disease, liver disease and “westie jaw”. The Pembroke Welsh Corgi (20-25 lbs) is a herding dog that originated in Wales and was used to herd cattle in rural areas. 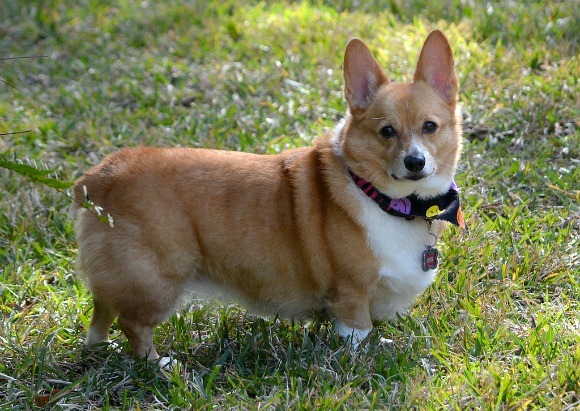 The name “Corgi” literally means “dwarf dog” in Welsh. The Corgi is a herding dog through and through, and loves games that involve chasing and agility. These fun-loving and intelligent dogs have no problem keeping up on the trail, however they can be domineering, and at times snippy towards other dogs or passerbyers, so be aware of this if you’re taking your Corgi on a popular trail. Aside from some eye disorders, this breed is generally healthy, with their primary cause of death being cancer or old age. This Belgian breed originated in the 16th century, and hilariously holds the nicknames “little black fox” or “Tasmanian black devil” due to their mischievous, inquisitive, and impulsive nature. The Schipperke (6-20 lbs) is highly curious, incredibly high-energy, and is always on the move. Schipperkes thrive on athletic activities, and hiking can be an awesome means of engaging them mentally, while also working some of that energy out. They tend to be willful and, if overindulged, can be rather manipulative. Making outdoor adventures a regular activity for you and your “little black fox” can aid in bonding, while also providing great training opportunities. In general this breed has few health concerns, however 15% of todays breed population carries a genetic mutation called MPS IIB, which can affect their balance and negotiation of objects. Aside from this, the biggest disservice you could do to your Schipperke is withholding physical exercise and overfeeding, as this can in turn lead to joint and skeletal problems. There are many reasons someone might prefer to own a small dog rather than a large one. Small dogs make great hiking and camping buddies because they can snuggle inside your sleeping bag to keep you warm at night; they’re a great conversation piece on the trail because people are amazed that “your little doggy made it”; and you can easily carry them out of the woods if they get hurt or tired. There are other advantages to a small dog too. Generally, a smaller dogs is better if you live in a small space and they are less expensive to feed. Also, if you like to travel a lot, a small dog is more likely to be accepted by dog-friendly hotels that have a weight limit. Speaking of travel, if you live in a RV full time, or are on a #Vanlife adventure of a lifetime, a smaller dog might be a more convenient travel buddy. As you can see, big dogs are not the only ones that are great for hiking and adventuring. A dog’s exercise needs, and the activities they enjoy, depend more on their breed and temperament than size. It makes me sad when I see dogs not getting the exercise they need just because of the stereotype that small dogs don’t need it. I know the stereotype exists because I hear so many “shocked” comments when we are out hiking. If you want a dog you can take on many hiking adventures, but your not sure a big dog is for you, I highly suggest you check out some of the breeds on this list. I have a chiweenie and often take him hiking with me, but it seems like he gets tired easily when hiking steep terrain and walks real slow. How have you conditioned your dogs to hike steep terrain? Hi Michelle. The answer to your question isn’t straightforward. I guess my first question to you would be how long have you been hiking with your pup and how did YOU work him up to longer and steeper hikes? With Chester and Gretel, they took to it right away. Still, I didn’t start out with steep or long hikes. I took them on their first hike not expecting a lot. I picked something with a bit of an incline but not too steep and expected I might have to turn around before we got to the destination. The first trail I took Gretel on was about 4 miles round trip. She didn’t even hesitate and had energy left at the end (that’s what you want… them to not be totally exhausted at the end for at least the first few hikes). If she had, I would have taken her on a shorter hike the next time. Anyway, once you know what they can handle, you can progress to longer and steeper hikes. It’s best to only increase one thing at a time – longer with same steepness one time and same length but steeper the time after that. Chester has been hiking for over 10 years and Gretel for over 6. They’ve just built up endurance over that time. Good luck and let me know if you have any more questions. The first few hikes we went on were fine for him, he has lots of energy left after the hike. It was smooth ascend, it’s when it gets steep for a section that he walks real slow and then runs down the hill. I just wanted to see if it’s normal for small dogs to have trouble with steep terrain. Thanks for your insight! Wonderful post! Small dogs rock! So glad to see dogs of all sizes hiking! I used to not like small dogs but then came to realize it wasn’t the dogs I didn’t like, it was the owners. 🙂 SO now I like small dogs, and I think our next dog will be small because yes they are much easier to take places. But I still love my big dogs, and the perk to that is they can carry their own gear/food! Small dogs really are the best. I have so much love for terriers, but the wire coat gives me such an awful contact allergy. 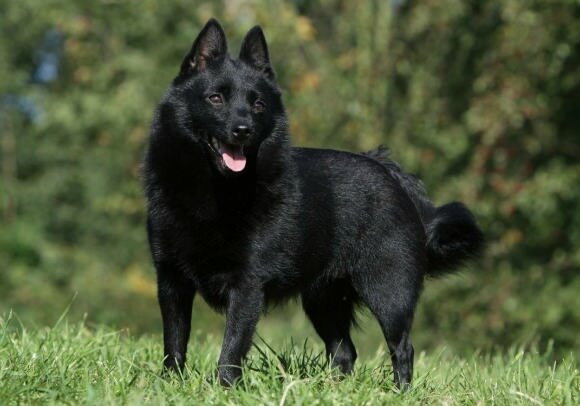 Schipperke’s are really cool little dogs; met a pair of them a few months ago and they seemed really fun. I love this little list. I love hiking, but never would have thought to bring my families little dachshund on a little hike. Maybe, I can work little Frankie up over time with increasingly longer walks around the neighborhood. Great read, thank you. Your article has settled several debates in our household. We have recently moved into a house with a garden and our 7 year old wants nothing more that to have his own dog. We enjoy a lot of outdoor activities so need a dog that will be able to join us. Great work, Jessica. You have put together a good list. In the beginning, I was kinda skeptical about small dogs as they don’t look like they would be a good hiking companion, but my doubts got cleared when I went on hiking with my friend and he had Jack Russell Terrier. He was fast, active, and covered all the miles without getting tired. Since then me and my hiking companions have got like 3 small dogs for hiking. Absolutely love to go on hike with them. Keep up the great work. Do you think it’s ok to bring my 4 years old pomeranian to high mountain , will she suffer altitude-sickness ? I’ve been bring her to 1700 meters above sea level, and she seems ok.
Now i have plan to climb a mountain high 3200 above sea level. Hi Kresnata. I wrote an article on dogs and altitude sickness. The bottom line is that every dog is individual but it’s not likely. Mine dogs have been to 14,500 feet (4,419 meters) with no problems at all. There were many other dogs at the top of the mountain too. Just in case, you should read my article on it though https://youdidwhatwithyourweiner.com/dog-altitude-sickness-hiking/. Have fun! I’m glad it worked out. I definitely think it’s best to err on the side of caution. A very insightful piece, thank you. 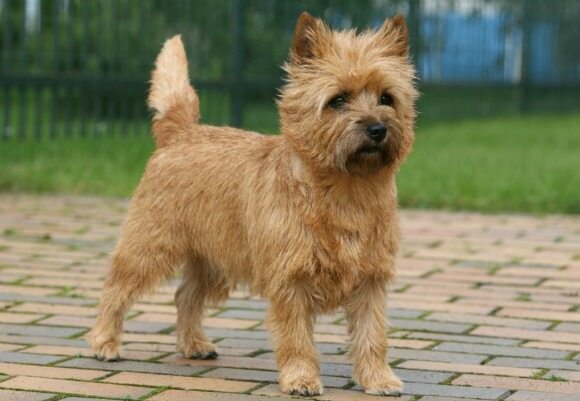 I am thinking of getting a Cairn Terrier and as an avid hiker I am glad they made the list. Is this a breed that would be best kept on leash like others you mentioned, or is it okay to give them free reign? That I don’t know because I’m not familiar with the breed. They ARE hunters but I think terriers can be trained to be off leash more easily than hounds. In general anyway. My cairn partner (Cactus) of 13 years died just two months ago. We spent many many many days/weeks in the big woods and never on a lead. His nose sometimes caused him to wander off 75-100 yards but he would always come looking for me (often winding the air to find me because i hid). I am now at the place where i can consider getting another pal and the only reason it won’t be a Cairn is sometimes Cactus had trouble with tall obsticals due to his short legs (we did a lot of remote bushwacking rather than trails). I think a Rat Terrier is my next buddy. I’m sorry for your loss but glad to year that Cactus got many fun, adventurous years with you. Great article. Very informative, thank you. I did want to mention one other small breed that is excellent for hiking. We have had a small mini poodle, I think about 12 lbs, and she is an excellent hiker. We take her on all our hikes. She recently completed a 10 mile hike with us and did awesome. We love our mini poodle! Keep up the great work! Hello, Iam a day hiker who recently adoptedand an 8pound min pin mix named Lilly. I want to take her with me n oselect hikes thisfalll. l found your article to be very helpful. I am looking for a backpack carrier that is roomy and well ventulated. Along with somestorage. Do you have any recommendations? Hi Betty. That’s great that you are going to take Lilly hiking. My recommendations for small dogs that are not Dachshunds are generally different because other breeds don’t have such high risk for back injury. That being said, it’s always been a challenge to find a dog backpack or carrier that is comfortable to hike in and also let’s you carry some regular hiking stuff like water and snacks. I would look at the K9 SportSack. There are only 1-2 small pockets on that one so you can’t carry much else but it’s comfortable to carry. The Muttmover from Timbuk 2 is a better option for dog comfort and carrying stuff but, still, the extra carrying space is not large and I didn’t find the pack very comfortable. The Outward Hound PoochPouch Front Dog Carrier might also be an option if you don’t mind wearing the pack in the front and your regular hiking back in the back. Good luck! Can dachshunds generally go off leash? I’m an archaeologist and I work in pretty remote places sometimes which can get lonely. It gets pretty dirty as well. I also tend to zone out and focus on digging so I can become pretty oblivious to things going on around me i.e. other people or critters coming up to me. I would love to have a companion come along with me. I also have to stay overnight in hotels regularly and can see myself camping for a job in the future. So a small, short haired dog seems like the absolute best option for me. I’ve always want a dachshund so I was SO excited to see them top the list! While I’m working, I can’t hold a leash so I need one that can go off leash. I don’t generally recommend that a Dachshund be off leash, no. Especially if the owner is not paying keen attention to them. They are independent-thinking hounds that have a high prey-drive so they wouldn’t think twice about running off on their own. However, with a lot of training, they could be mostly reliable off leash… or at least the chance that they would come back to eventually could be more reliable. If I was in your situation, I wouldn’t hesitate to get a Dachshund. However, I would bring a long leash and tie one end to a tree or something while you go about your business. That way they have room to roam but won’t run off. The main drawback is that the leash could get caught on something so you might need to check on them periodically. Also of note: my recommendation would be the same for any type of hound or terrier. Papillon make great hiking buddies too. Friendly and bright they will either love sport or prefer to stay closer to home. I currently hike with my yorkie but may have a new Pap joining us later this year. My friend’s chihuahua also loves long walks and is a parkour champion. Great to see we are not alone in both hiking with small dogs or getting shocked looks! I love hearing that you take your littles out on the trail 🙂 It seems normal to me to hike with any dog, no matter the size, but it’s true that I encounter people shocked that a small dog can hike more often than not (like 90% of the time it seems).